NeVeTeC will only be able to assist in getting your Police Clearance Certificate also called Behavior Certificate when you send us original fingerprints obtaining from a legal entity like a Police Station or Embassy. We are using our courier service system to deliver your documents to the Criminal Record Centre(CRC). 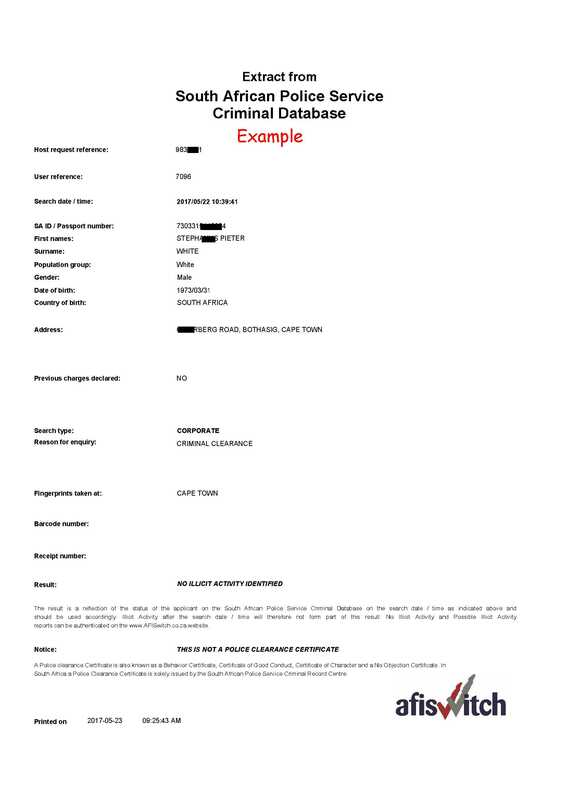 Please take note the Criminal Record Centre is currently sending the Police clearance certificates back to the Police station where the fingerprints was taken if it is in South Africa. Please take note NeVeTeC still provides our normal electronic fingerprint criminal clearance with the result back within 48 hours as per example. Although this information is extract from the same criminal database, this is not a Behavior Certificate. Please make sure our 48 hour clearance will be stuffiest for your use before you decide to go for this option.